What a day. After a long night of Allistaire moaning in pain because of her left knee and trouble falling back to sleep over and over, I literally awoke crying, tears in my eyes fearing the MRI would show cancer in scary places like her brain and spinal column. We take out her Hickman catheter and put in a port and go to Disney World and that will be it I thought. I worked hard to bring the fears before the Lord, to look past the immediate and hope in the long view. I was settling in, feeling a bit more at peace and about to partake of my morning coffee and breakfast sandwich (once again, for about the 80th time, funded by one of you sweet people), when I got a phone call I was not expecting. When (206) 987-0000 shows up on your phone, you know to be on the alert. It was the Children’s Hospital financial counselor calling to ask what I knew about our insurance not paying for the clinical trial transplant because she’d just received a call from her social worker saying that this had been brought up in early morning rounds that I had apparently missed. I determined to go straight to the one person who should be able to straighten things out. She is on vacation. However, her sweet supervisor was so gracious to me, but didn’t immediately know the answer, not having our file in front of her, and thought she remembered that they were appealing the denial. In a moment I think all the intensity of these days came rushing in because my heart started to pound in the most thick slow way and my whole body flushed red. I could hardly speak getting off the phone with her. I broke down, yet again, in Starbucks, though thankfully in my mostly hidden corner/favorite table spot. About an hour later I was trying to get Allistaire to drink apple juice with contrast in preparation for her CT scan when the supervisor called back to say she’d just gotten off the phone with the Blue Cross Blue Shield rep who emphatically affirmed our insurance WILL cover the transplant. I don’t know where the failure of communication or misinformation began, but I was so relieved. Minutest later, Allistaire threw up all her apple juice with the contrast and it was time for clothing and bed change and laundry for her blanket and doggy. Back to the task of getting more contrast into Allistaire. We succeeded within just minutes of needing to have it in on time for the CT scan. Allistaire mostly laid in bed and sucked her thumb and minimally watched movies. Sweet Dr. Pollard came to talk with me just before her CT and MRI. She said that it looks like Allistaire qualifies for the transplant, at least such that we can move forward with the standard testing prior to transplant. One of the main questions had been, whether or not her chloromas (the leukemia in her back and lymph node) would disqualify her from the clinical trial transplant. It was determined that they would not so she would be ready to move forward assuming nothing unexpected showed up in today’s scans. It sounds like the radiology oncologist will likely want a biopsy of the location on her back where the lump was to see if there is active disease. This will help him to determine whether or not to simply radiate at the sight of the chloroma or expand the field of radiation. At this point I don’t know when this would be scheduled. I am told that the BMT people at the SCCA are in communication with the preferred donor to coordinate timing. 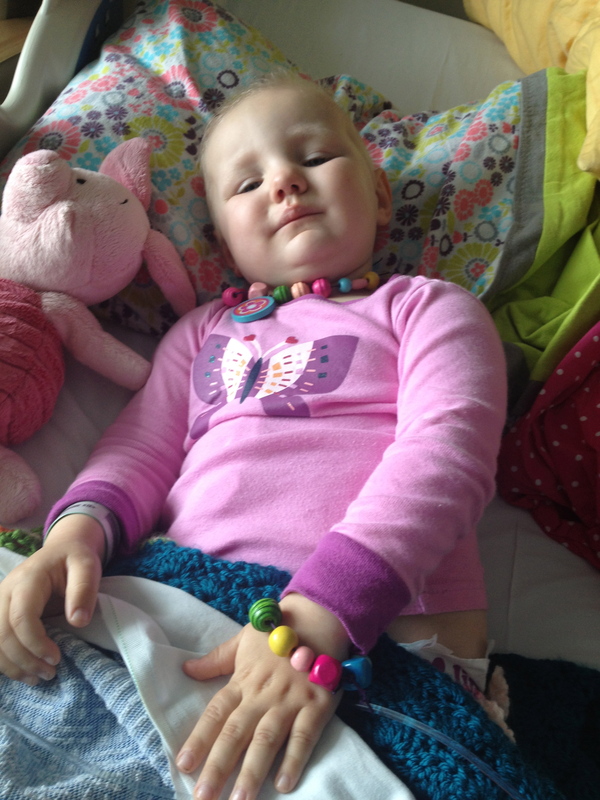 Depending on this timing, Dr. Pollard may give Allistaire a bit of chemo just to sort of tide her over until transplant. In my conversation with Dr. Pollard I mentioned that Allistaire’s left leg and it seemed, more her knee, had been hurting her since yesterday. Sunday evening she was running around at the playground with Papa and when I saw her mid-day on Monday she said her leg hurt. By the evening, when we went out foraging for food for dinner at about 9pm, she would not even stand on her leg to get into her stroller. She has not walked or stood since and required several doses of pain meds overnight and into the day. Dr. Pollard quickly made a phone call to add the left leg to the MRI scans that would be done. At about 4:45 she was finally wheeled into the recovery room to wake up from anesthesia. Within 10 minutes there was a sudden call to add an x-ray of her leg before returning to her room. She woke up about 15 minutes later and was given an x-ray with the handy portable x-ray machine that the guy simply wheeled into her recovery room. But I of course was wondering what could be up and soon learned there was concern about an infection in her bone. So we return to her room and just start to get settled in when the orthopedic resident comes to talk to me about their concern that she has osteomyelitis in her distal femur of her left leg. They see on the MRI a small walled off area that could be infection. Dr. Pollard had mentioned that an infection was possible due to really low counts for such a long time. The joint does not seem to be involved. Typically such an infection would show up in particular blood lab values that indicate inflammation (these labs were drawn but have not come back yet), fever, inability to bear weight and a high white blood cell count. However, because Allistaire’s immune system is all wacky from ongoing chemo, lots of these indicator may not be present because of her body’s inability to mount a sufficient response. Another possible reason to believe this could be an infection, is it’s timing that coincides with having her antibiotic, Cephapime, discontinued in the last day or two. She has been on this antibiotic since March 16th, and it may be what has been keeping this infection at bay. The orthopedic doc consulted with his attending doc and they decided that they would have the infectious disease docs stop in and determine what sort of antibiotic to start at what dose and that they would possibly do surgery on Thursday or Friday to clean out the infection. The location of this spot is close to her growth plate so they will be using some sort of guidance to avoid the growth plate. So then the resident doctor comes in and says that they are going to start Cephapime tonight and the infectious disease docs will come tomorrow. Not ten minutes later the Fellow comes by and says they will not be starting antibiotics because she is wanting to get Allistaire in for surgery tomorrow to see what is going on in her bone because it also could be a leukemic infiltrate – i.e. another chloroma. Her thinking is that the BMT docs will want to know exactly what this is, and she doesn’t want to have anything slowed down for transplant. She does not know if a chloroma in this location would in any way prevent transplant but of course, that will be yet another question for the BMT folks. She wanted to hold off with antibiotics to get the clearest look at what this is. Of course, if it is a leukemic infiltrate, that will be very clear. A surgery tomorrow would mean being NPO (not eating or drinking) until she could be worked into the surgery schedule which would quite likely be later in the day. She ate no more than 5 fish crackers since she was able to eat this evening and not even 5 sips of milk. I was not excited about basically 48 hours of no eating, but what are you going to do? So that last conversation with the fellow was at 9:30pm. It’s now an hour later and the CNA just came in to check Allistaire’s temp once again. Once it gets over 38.3, they check every 30 minutes. She usually is at around 36.6. Well, she just hit 38.7 which is officially a fever which means blood cultures will be drawn and antibiotics will be started. I have no idea what this will mean for any surgery tomorrow. On a really super AWESOME positive note…there is no evidence of disease in her brain, spinal column or spinal fluid!!!!! These are all major victories! All of her organs are looking good from the imaging. There were two small nodules on her lungs from at least a month ago which is extremely common in kids who have had a lot of chemo. The assumption is that these are small areas of fungal growth. She was switched to a broader anti fungal, voriconazole, as of about 3 weeks ago to provide better fungal protection. Today’s scan showed no change with one of the tiny spots and that the other tiny spot looked diminished in size. In addition, it looks like the area on her back from her original site of her cancer’s return, has decreased somewhat in size. Nothing was mentioned about her lymph node so I’ll have to ask about that tomorrow. Her flow cytometry results are not back yet, but there was a revision in the morphological results. The number they are reporting is 62%. Hey, I’ll take any decrease we can get! This is 8% less than the ballpark number they gave Dr. Pollard yesterday. Of course, it has often been the case that Flow results are higher than morphology but we’ll just wait and see. This doesn’t change the transplant option but I will be curious to see what the final numbers are because it may at least indicate a decrease from a month ago. All in all, I am so thankful for so many good results! There was good news today! One of the last things Dr. Pollard said in our meeting today, however, is that she had to be honest, that she always has trepidation until conditioning begins because things can always change. Today’s issue with Allistaire’s leg which has only made itself known in 24 hours is a perfect example. And perhaps you get a better sense of how even interacting with the multitude of doctors who collaborate on Allistaire’s behalf can be an ever-changing, often confusing and sometimes frustrating reality. I think I need to harken back to advice given me by a parent who had walked one crazy road with his AML son. He told me how you just have to kind of ride things out. Don’t get too amped up when things look good. Don’t get too low when things look bad. And as my nurse friend responded when she heard that – yeah, or your adrenal glands might explode. It think I was on the verge of internal combustion today when the question of the financial coverage of transplant was raised. I need to learn to just ride the wave a bit more. Highs and lows. Wow is it a ride. Gayle and I were praying when your post popped up on my laptop that was on my lap because we were checking to see if you had sent an update today. Praying for you to that God up there who knows what tomorrow holds for you and who loves you and Allistaire more than I could ever imagine. And whose ways are so different from ours! I am relieved for you that there has been some good news. And that means hope remains for amazing news! May you find some rest for the journey ahead. Dearest jai, oh my dear, i was up late with your mom at bsf sharing night. Asked if any news on test. “not yet she says”. I was hurting bad from an extra long night sitting so i hit the bed soon as i got home didnt check blog didn’t expect any news. Well dear today i turn 60 was hoping God would grant me a less painful day. Well, roller coaster is right. I got up, got all my quiet time, Bibles, devotionals etc. I love a book from amile away the older the better ask your mom some early 1900 devotionals ive loaned her…. Anyway, i was happy all set to go and thought i need to check blog an emails in case so I will know how to pray. Well, i dont mind saying i cryed on and off rest of day, didnt want to go to movie or have fun couldn’t even think of it. I so could fill your emotions i got sick felt like mini heart attack. I know what u mean about to have an internal melt down… ONLY OUR MIGHTY GOD HOLDZ U TOGETHER RIGHT NOW BRAVE AND STRONG GIR IM AMAZED. I TXT UR MOM A COUPLE OF TIMES ONE WAS IN MY STUDIES IT SEEMS I JUST TRIPPED ON THIS VERSE BLEW ME AWAY AND I HAD MY FIRST EVER MINI QUESTIONING WITH ABBA. READ PHILLIPIANS 2:27. YOU’LL SEE. I SENT MY PRAYER TO YOUR MOM WHILE i was txting her i got fired up with this horrendous pain. Well, anyway. I havent left my room or Bible all day… I felt such unrest… Like God show me the secret to unlock this suffering. I indeed know years of it and i hurt so bad dearest for you(ALL). I was just going to finish some reading about what the new agerz have petaled into our churches… And thought ill check blog… Hon. Im with you every tiny bit of good will ad up… U watch. I pray soon you’ll be looking back at this with a good out come and say again CWHAT A HELLA A RIDE GLAD ITS OVER MY LORD JESUS. AMEN! Cont. I always lose some txt? Anyway i started to tell u when i was in 2nd grade id hide under blanket in our bed i shared with 2 sisters, with flash light onreading how to build a log cabin on plum creek with laura ingels? Forgive my txting and spelling since chemo and radiation on right auxiliary , breast, lymph nodes, surgery, stage 4 metastasis? Merkelcell carcinoma, an neuro indocrine… Blah blahi wS saying i cant remember how to spell words or say the ones im thinking, and im right handed and left with a spaghetti arm an hand so weak and cant feel the buttons. So, im so imbarressed looks and sounds like i didnt finish grade school. I so am amazex by your beautiful gift with words. I always wantex to write an sing can’t do either in this life oh well im still alive. And Merkels my 3rd cancer… And its not yet come back,,, but im on 7th yr. Fighting another been on daily non stop chemo med since a yr, ago this month… Etc…. So i know cancer and once its came to visit it changes life forever zafter in so many ways. Just know my prayers do not reast til we when this battle. Gods right there precious just dont let go. Remember you’ll have plenty time like the rest of your lift to mourn if baby girl goes to be with Jesus so, don’t even go there now. It will not help and IT WONT PREPREPARE YOU OK. SO SMILE AND LOVE BEST YOU POSSIBLE CAN NOW. FOR REALITYS SAKE CUZ WE DONT FOR SURE know anything but we can hope hope hope… So stong girl go to it… U can do this.. Ive seen you. Give that enemy no grounds for his scare tactics… Things are natually scary enough amen? Well, thats my attempt at encouragement dear one. God guide you and uphold you ever so high. My love and sincere compassion every minute. . In Him Eternally joette. Read now… Psalms 62:5-8. Boy, this is heavy and complicated. Praying for riding the wave and healing for that poor little soul who is enduring so much. I am continually praying for all of you. Whenever I read your blog I always end up singing the song Because He Lives. I just think that there are times we can’t face tomorrow on our own and it’s so much better to know that God is here and He’s faithful. I will pray that you get some sleep and that you get more positive news as the days pass. My heart is smiling with the good reports, Praise God!!!! Please, Lord, wrap your arms around this family and continue to give them strength to weather this storm! Amen! Jai, praying for you guys. I am glad there was some good news. We miss you so much here in Bozeman. The Lockie family is praying for you all.